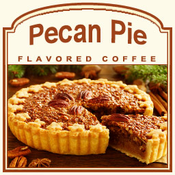 The Pecan Pie flavored coffee offers a full-bodied flavor of roasted pecans. If you like the taste of Southern pecans, let these 100% Arabica beans inspire your taste buds with its savory and buttery flavor. Fresh tasting and warm, this Pecan Pie flavored coffee will remind you of Thanksgiving � even in the middle of summer. Go ahead and indulge in this decadent classic, whenever or wherever! A heat-sealed valve bag will ensure the freshest coffee possible, which will be freshly roasted and shipped on the same day. Warm and toasty in flavor, this Pecan Pie-inspired treat will provide loads of southern charm in each and every sip of this flavored coffee!